These shortbread cookies were an experiment a few years ago when we wanted to take cookies to a friend who lived in Russia for a few years. They were a delicious hit. They are different from most typical cookies, they are crumbly versus chewy, but they are delicious with a cup of herbal tea or hot cocoa. My kids LOVE to make these because they get to roll them in the sugar. I love them because they are so fast to make and don’t require constant watching like other cookies. A win all around! Mix together the butter, powdered sugar and vanilla until well combined. Add the flour and salt, mixing again. 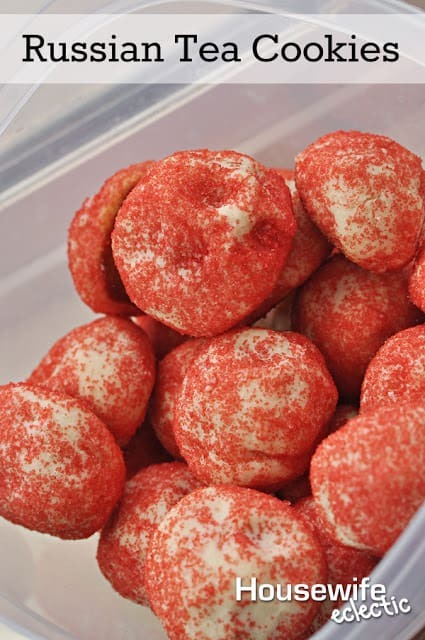 Roll the dough into 1-inch balls and then roll them in the sugar sprinkles. Bake the cookies on a GREASED cookie sheet for 10 minutes at 400 degrees. Cookie should be stiff but not brown. Have you ever tried these kind of cookies before? Yum. Such a simple, yet fun, festive cookie. Did you try adding an egg yolk to your batter? It'll taste so good! These looks delicious! I love cookies that are coated in powdered sugar! I haven't tried these before but I'm searching for a good cookie swap recipe so….I'm pinning for later! I am all about easy baking. These sound great. These are so cute! I think I have all these ingredients so may need to make these this weekend! Simple recipe, I remember having shortbread as a kid. I haven't had it for years though being vegan now. These look delicious! I love finding new and easy recipes. I love Russian tea cookies! but I have never made them before. I will need to tuck this recipe away. I love Russian Tea cookies, but I've never tried making them. I will save your recipe for later. Oh yum! These look REALLY good!!!! These look so good! I love cookies! I have not tried these types of cookies before, but they look good. I do a lot of baking, but cookies aren't my specialty. My Mom and all of my aunts are experts at cookie-making, but that talent skipped me unfortunately. OMG these cookies sound delicious! So pinning to try your recipe out myself! Mmmm I love Russian Tea Cookies! Delicious!! Yum, these look so good! Thanks for sharing at Merry Monday, hope to see you again next week!